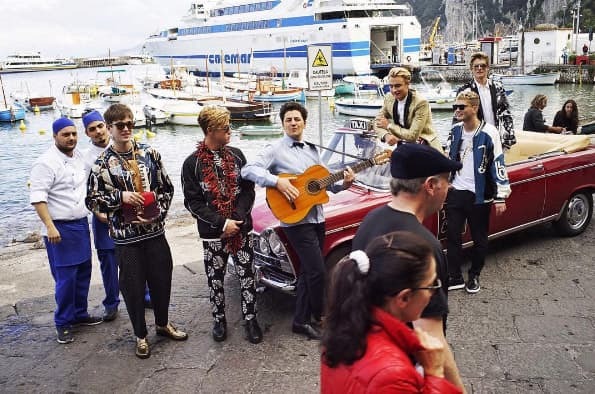 Dolce & Gabbana recruits Hollywood offspring for its latest ad campaign | HELLO! Dolce & Gabbana has signed up some familiar faces to showcase its latest collection. The brand has recruited what it calls "The Millenial Generation" to star in the new SS17 campaign, which is currently being shot in Capri, Italy. Joining the line-up are a number of celebrity offspring; Jude Law's son Rafferty Law, Cindy Crawford's son Presley Gerber and Gabriel-Kane Day-Lewis, the 21-year-old son of Daniel Day-Lewis. The impressive roster doesn't end there though, as Pamela Anderson's son Brandon Thomas Lee also stars in the campaign along with Cameron Dallas, a Vine star turned model with a huge 16.1million Instagram followers. The group have been sharing a number of photos from their fun-filled photoshoot on social media using the #DGMillenials, and the women's shoot seems to have as much potential to go viral with singer Zendaya, model Thylane Blondeau and Brooklyn Beckham's ex-girlfriend Sonia Ben Ammar among the recruits. It appears Dolce & Gabbana has fully embraced the new fashion generation, with the front row at the recent Milan Fashion Week show dominated by celebrity offspring, YouTube and Instagram stars.